Did Jean Hill Change Her Story? 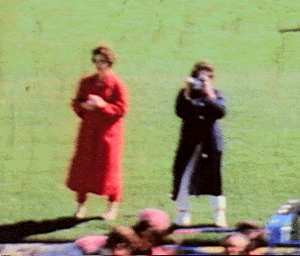 In the aftermath of the Kennedy assassination there has been a lot of discussion over just what Jean Hill saw, did, didn't see, and didn't do. Some have been quoted as saying she saw a "fluffy white dog on the seat with the Kennedys." Additionally, there have been charges over the years that Hill, who died November 7, 2000, altered her story. In response to all this I have put together the following document and transcripts. You can read and decide on your own just what the facts are. Hill: "Just as Mary started to take the picture and the President became - came right even with us, two shots, and we looked at him and he was looking at a dog in the middle of the seat. Two shots rang out and he grabbed his chest - and a look of pain on his face and fell across toward Jackie and she - uh - fell over on him and said 'my God he's shot.' And - uh - there was an interval and then three or four more shots rang out by that time the motorcade had sped away." Bright: "Could you see, were you a witness, did you see the person who - who - uh - fired the"
Hill: "No not I didn't see any person fire the weapon." Bright: "You only heard it." Hill: "I only heard it - and I looked up and saw a man running up this hill." Bright: "Uh, could you tell me uh, you had no idea." Hill: "No, I had no idea and nothing to go by. I mean I don't think it dawned on me for an instant that the President had been shot. I mean I knew and yet it just didn't register." 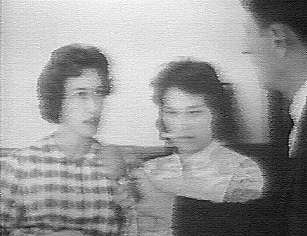 "Just as Mary Moorman started to take a picture we were looking at the President and Jackie in the back seat and they were looking at a little dog between them. I looked across the street and up the hill and saw a man running toward the monument and I started running over there. By the time I got up to the railroad tracks some policeman that I suppose were in the motorcade or near by had also arrived and was turning us back and as I came back down the hill Mr. Featherstone of the Times Herald had gotten to Mary and ask her for her picture she had taken of the President, and he brought us to the press room down at the Sheriffs office and ask to stay." Later that day Hill mentioned to Moorman that she could understand how movie stars like Liz Taylor or the Gabor sisters would travel with a dog but couldn't understand why the Kennedys would. She then thought, because of all the confusion, that it was not a dog but the roses on the seat. It became a source of embarrassment to her. However, it merely shows how confused people become when faced with a sudden and unusual event. 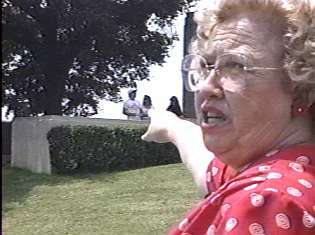 The show's JFK segment opens with the playing of the movie clip of Ellen McElduff's portrayal of Jean Hill in Oliver Stone's JFK. "And then shots rang out. Mary fell to the ground right away. She yelled they're shooting, they're shooting get down. I just stood there watching. Then out of the corner of my eye, I saw a flash of light in the bushes and that last shot just ripped his head off. I looked up and I saw smoke coming from over there on the knoll." Oprah: "Did you like the woman who played you?" Hill: "Yes, she did I thought an admirable job." Oprah: "Good that's the first thing . . "
Hill: "But the thing that really got to me was Oliver Stone's meticulous attention to detail." Oprah: "Uh-ha. So what when we see the character that portrays you in the movie - is what that character says in the movie playing Jean Hill - is that accurate? Are those your words?" Hill: "It's completely accurate, he had me down on the set to make sure he did everything uh with [unintelligible]"
Oprah: "Well can you tell us what you saw that day? Oliver Stone is coming on by the way. I didn't mean to take your thunder. Go ahead can you tell us what you saw?" Hill: "Well it's exactly like he portrays it in the movie. The motorcade comes around I did see the flash of light the puff of smoke at the moment the President's head was ripped off." Oprah: "Over on the . . ."